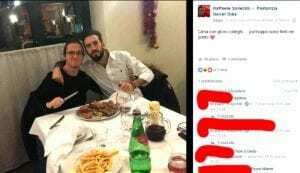 Amanda Knox’s former boyfriend-of-one-week was exposed in the Italian media on January 19, 2017 for his piercing posts. The story first appeared on ‘il Fatto Quotidian’ and has blown up all over the Italian media while the American mainstream media has, so far, refused to report on it. “That Denis writes: Teacher teach me how to erase the traces of a crime that I have two things to solve?. Raffy responds: don’t worry, I’ll be nice and painless “. If these comments were not enough, there are also those who allude directly to the murder of Meredith. Reports the Lucarelli: “her: you look pale, you’re not going to the beach?. Raffy: Eh I see so many people turn pale. Raffaele attempted to work as a crime expert on Italian television but the public revolted and a change.org petition was started to fire him last April. Almost 24,000 people signed the petition to stop Sollecito from becoming a TV pundit. A few months earlier, Sollecito received $73,000 from the Italian government to start a website catering to funerals and graveyard maintenance. Sollecito is in court this month to sue the Italian government for another half a million euros. In between television interviews, book signings, lawsuits, and website work, Sollecito manages to find time to give advice about murder. Face of Patrick Lumumba is photoshopped onto Raffaele’s friend’s face. Patrick was wrongfully accused of the murder by Amanda Knox. Her conviction of criminal slander was finalized by the Supreme Court in 2015. The former murder suspect appears to be collecting selfies with knives. Those who have followed the case of the murder of Meredith Kercher know that two different knives were used in the attack on Kercher, a large kitchen knife and a smaller pocket knife. A large kitchen knife was found with Amanda Knox’s DNA on the handle and Meredith’s DNA on the blade. Raffaele Sollecito ………. Yes, of course. Thank you for reminding us. We nearly forgot him. But – OK – let’s take the time & a further look. What kind of personality structure showed itself back in 2007 ? Think Raffaele Sollecito was a kind of a „lonesome cowboy“ then. A young man, no friends. Insecure but with questionable hobbies / passions such as collecting latend dangerous things like (switchblade -/ jack) – knives or beeing an enthusiast of violence – comics. So indeed. Regarding to this aspects there are some more informations that we can get. Seems that he was a „drifter“ that time. Not deep – rooted in the town of Perugia but accompanied by extremely present violence phantasies. Think he was badly hurt by the death (presumably suicide) of his mother two years earlier in 2005 that touched him as a radical & highly emotional cesura. Radicalized by subsequent feelings of great loss & internal unrest since those days. He seemed to be a person without firm ground under-neath his feet. A tendency to use different types of drugs, routinely marijuana for sure but also cocaine I think and perhaps some drinks on top. Permanentely supervised by his father (daily phone calls) who (obviously) had ominous forebodings day by day. A young man showered with money and all kinds of material things / possessions but without any real love. Disoriented and psychologically completely disturbed. In short: I think Raffaele Sollecito can be viewed as a labil, latent dangerous person back in those days. Obsessed with violence fantasies. A hard – hitting chemical waiting for its catalyzer. On the other hand there was Amanda Knox who (my opinion) felt (and probably was indeed …) completely lost that time back in Oct. 2007. Lost in a foreign country. No friends, no task, no responsibility, no money. Only the nagging feelings being bullied and rejected by all the other young people. In truth she was a „drifter“ too, not Rudy Guede who lived in Perugia since he was 5. No question. Rudy Guede never has been a rich person. But – unlike Amanda and Raffaele – he was at home. Interesting that Amanda Knox’s DNA was also found mixed with Raffaele Sollecito’s on the clasp of his pocket knife. I really like the comment by November2007. It crystallized my own thoughts. Why did Raffaele’s father call him twice a day? And was his mother’s death suicide? Raff was an accident waiting to happen. I also wonder about his “computer science” curriculum. Was it “real” CS of the sort that leads to an engineering degree at schools like MIT and Georgia Tech or was it intended for unemployed adults looking to get jobs as network technicians? Raff says he was stoned 80% of the time and reportedly spent much of his life masturbating, so I have to wonder whether he, like Amanda, had too much time on his hands. As for Amanda, I think of her as damaged by her father’s early abandonment, even though he came to her defense later. And I think of her as a typical affluent blue-state brat who thinks moral rules are for squares. She didn’t earn the money for her trip: most of it came from her parents in monthly deposits, and she burned through a lot of it taking her one course in a notorious party town.